In general, I prefer to wear pinker shades year round. I'm ghostly pale 10+ months of the year, so I find that they better suit my complexion. That beings said, I do try and change up my makeup routine in different seasons. I'll wear vampier berry toned lips in the fall and winter, and maliciously line my lips red, and perpetually check to make sure my bright red lipstick hasn't smudged everywhere during the day. 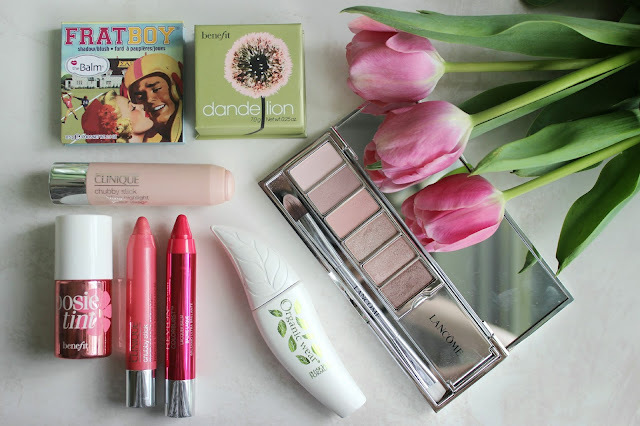 But there is something about spring makeup that I find most appealing. It's simple, light weight, and very feminine. In the last few weeks, I've been enjoying putting on my makeup more so than I have in quite a while. So today, I'd thought I'd share my spring edit makeup essentials. Cheeks: (1) The Balm Frat Boy, the perfect peachy pop. (2) Benefit Dandelion, very subtle, light glowy finish. (3) Clinique Chubby Stick sculpting highlight, a silvery luminous cream highlight. 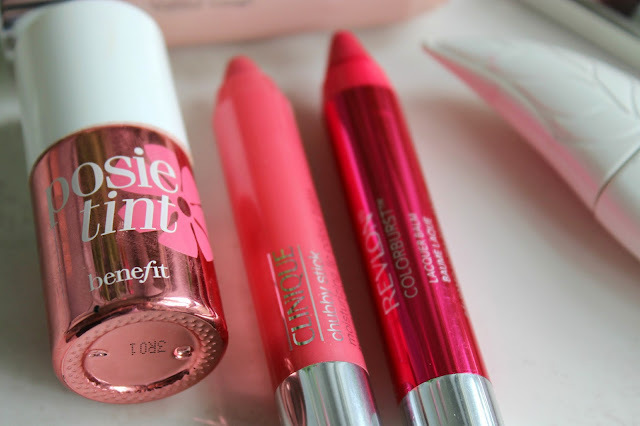 (4) Benefit Posietint, a liquid blush that can easily be layered under Dandelion, or used as a lip stain. Mouth: (1) Revlon Colourburst lip balms, they range in intensity and colour, but I'm quite partial to the sheerer formulas, like the lacquer balm pictured above. 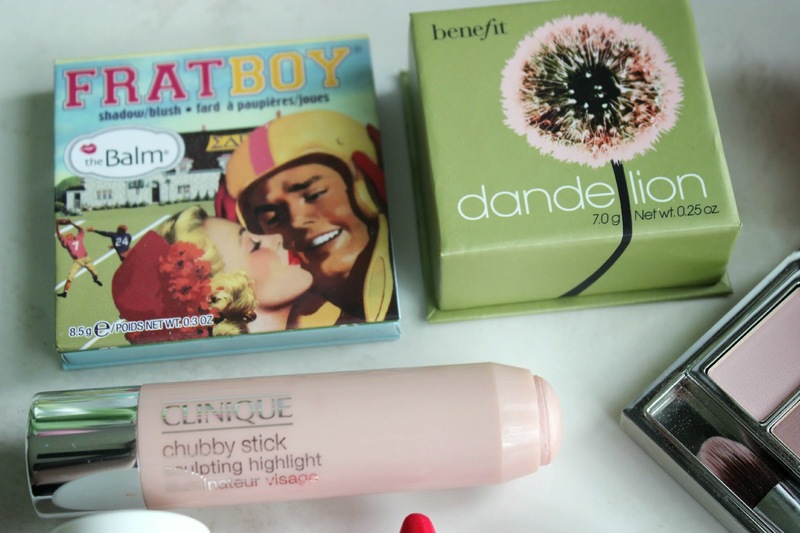 (2) Clinique Chubby Sticks, very similar to the Revlon, but at a higher price point, these range from the baby sheer tints, to the intense full on lippies. I've opted for the middle ground, with the shade mighty mimosa. 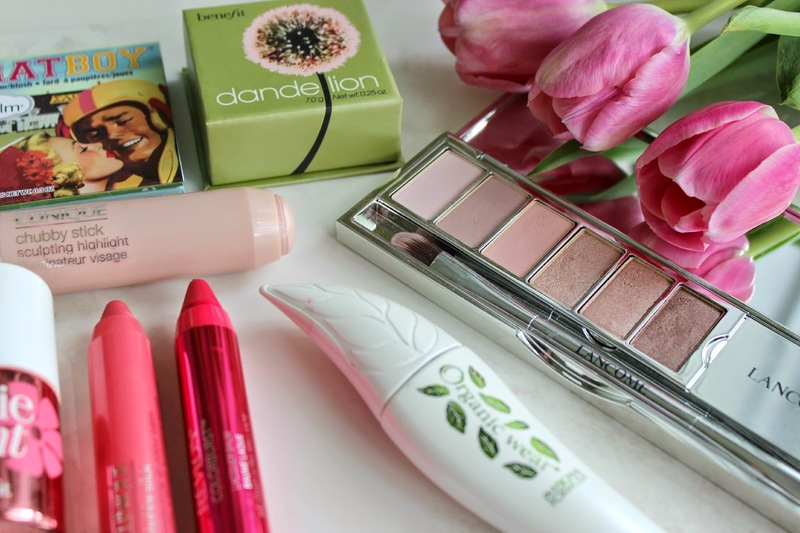 Eyes: (1) Lancome French Innocence palette, which I did a full review on here. (2) Physicians Formula Organic Wear Mascara, a volumizing lifting, curling, and lengthening mascara that does it all. What makeup items have you been reaching for the most lately?